At UF Health, we constantly strive to keep pace with the growing health care needs of our community. It’s why we opened another medical facility in Northwest Gainesville at UF Health Springhill. The newest 72,000-square-foot building is adjacent to UF Health Springhill off 39th Avenue. It allows UF Health to expand primary care offerings in a place that is easily accessible for patients, said Laura Gruber, UF Health Physicians administration senior director. The facility is home to the following specialties: child psychiatry, allergy, family medicine, psychology, integrative medicine, internal medicine, lab services, pain medicine, pharmacy and senior care. Some UF Health practices — including family medicine, integrative medicine, allergy and pharmacy — are moving to the new building from spaces leased in other parts of Gainesville. UF Health internal medicine and senior care have opened a new practice at the Springhill location in addition to their current locations. Other practices, including child psychiatry and psychology, as well as the medical lab, are moving from the original Springhill buildings into the new adjacent space. Brad Pollitt, A.I.A., UF Health Shands Facilities vice president, said sustainability is a major focus of UF Health construction projects. A number of systems, including special insulated and energy reflective windows, high-efficiency lights and demand airflow with carbon dioxide monitoring, will work simultaneously to decrease the consumption of power and fossil fuels while optimizing utility consumption. Variable refrigerant flow technology cools the space while providing free heating to other areas of the building. When it’s closed for business, the building technology sustains optimal temperature and humidity levels. Meanwhile, the building has a welcoming atmosphere for visitors and staff. The new outpatient pharmacy and clinical laboratory as well as the allergy, internal medicine and integrative medicine practices on the new building’s first floor opened to patients on Aug. 6. The family medicine and pain management practices on the second floor opened their doors on Aug. 13, followed by the psychology and child psychiatry practices on the third floor on Aug. 20. 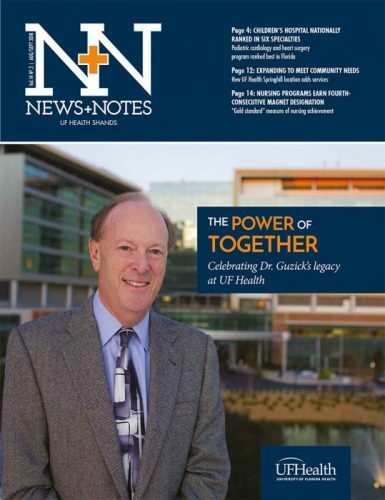 You can visit Blueprints on Bridge (under the “News & Events” tab) to learn about our growth and expansion and visit UFHealth.org/Springhill to learn more about this new facility.